When originally planning a trip from Alaska to Argentina one of the biggest initial dilemmas we faced was the decision about what we were going to do about bikes. More time to be able to set the bikes up exactly how we like them and know their condition. Traveling on Australian registered bikes, with Australian passports (saves confusion with authorities). Expensive to transport the bikes. Bikes more expensive in Australia. Bikes, parts and accessories much cheaper in the U.S.
Don’t have the hassle/expense of freight to/from Australia. Take more time to organise purchase and setup bikes. Can’t be sure of the condition of the bikes until we get there (no time to get to know the specific bike). Illegal to sell bikes in most South American countries and cannot bring the bikes back to Australia (due to import restrictions). Buying the bikes in the U.S. or Canada would probably have turned out to be a bit cheaper, however it would’ve taken a lot longer (and more hassle) at both ends and we both decided we’d rather spend that time riding! One we’d made this decision, the next choice was how to get the bikes there. Sea is generally a fair bit cheaper, however the transit time is much longer (and slightly unpredictable) and costs can add up in handling at the docks. Whilst it is a bit more expensive, we chose to fly the bikes over due to the timelines we needed to stick to in order to meet the ferry that would take us up to Alaska. Getting quotes to do this was a frustrating experience with everyone providing quotes that included different aspects and not others, making it very hard to make an equal comparison. The other thing I found was that not many companies had any experience with shipping bikes and gave us differing stories as to how we would need to prepare the bikes and what the cost would be. In the end we decided to go with Bikes Abroad due to the really competitive quote and their direct experience with motorbikes. Worked out to be a good decision as Ivan, one of the directors, turned out to be a great help, even sourcing a suitable 2nd hand crate from someone who was bringing furniture into Melbourne. Here are some tips on building the shipping crate and here is more info on the process of getting the bikes cleared in Vancouver. 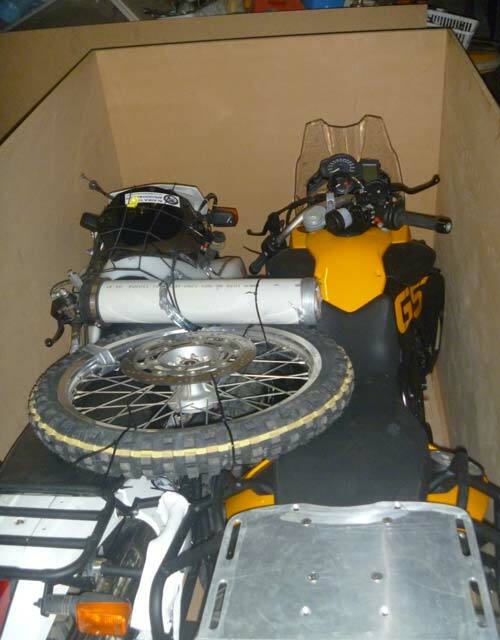 DR650 and 800GS packed in with sides on the crate. 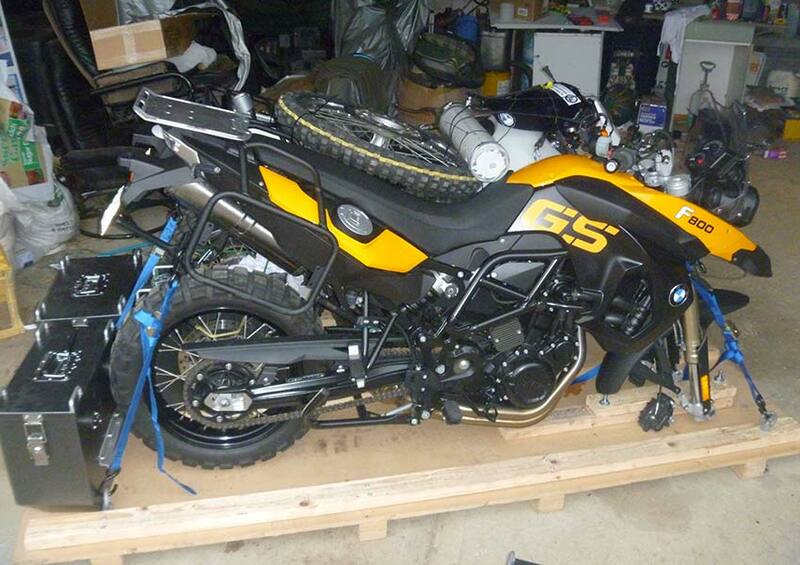 Ok so our initial plan here was to ship the bikes back from Buenos Aires by sea. We were in no hurry to have the bikes in Australia and were just looking for the cheapest way to get them home. I still think this is possible, however it is very hard to find anyone in Australia or in BA that knows and easy, cheap way to do it. From what we have been told at the BA end is that it is a massive process that essentially requires you to stay in the country until the ship leaves port (in case something changes/goes wrong and the container needs to go on another boat). 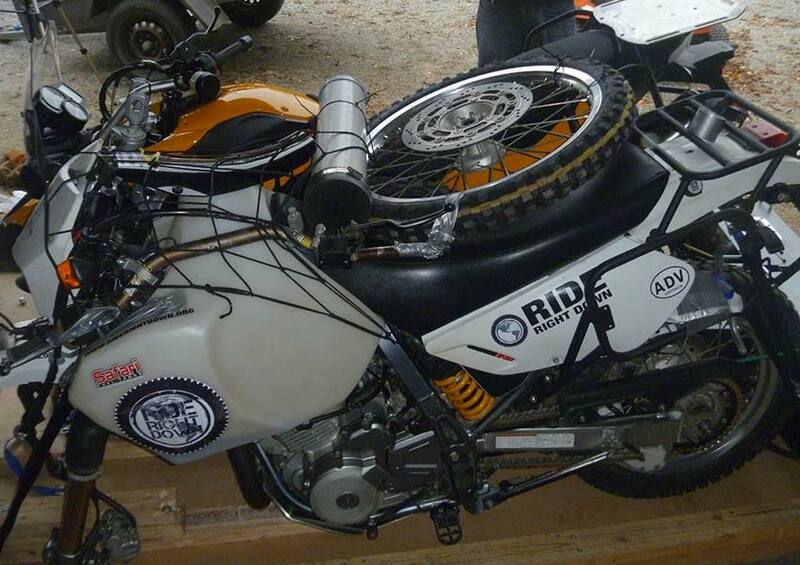 Should you decide to go down the airfreight route Sandra from Dakar Motos can definitely help you out. For US$100 she will organise the lot for you and gives a very good deal on airfreight.